The Audit Trail is an Oracle inbuilt functionality that lets audit specific columns belonging to selected tables. This implementation enhances the security of the system. For each audited table (i.e. FND_USER), the system will create a shadow table named tablename_A (i.e. FND_USER_A). The maximum size of the shadow table name is 26 characters. The columns to be audited should be selected carefully to avoid an impact on the performances of the system. According to which table we want to audit, there can be a different table owner on which the auditing should be enabled. The query above will show that the owner of all the tables we want to audit is the user ‘APPLSYS’. Querying the username ‘APPLSYS’ and making sure that the Audit Checkbox is enabled. The Audit Group will contain the list of the tables to be audited for our purpose. The User Table Name of the FND_USER table is ‘Define an Application User’. 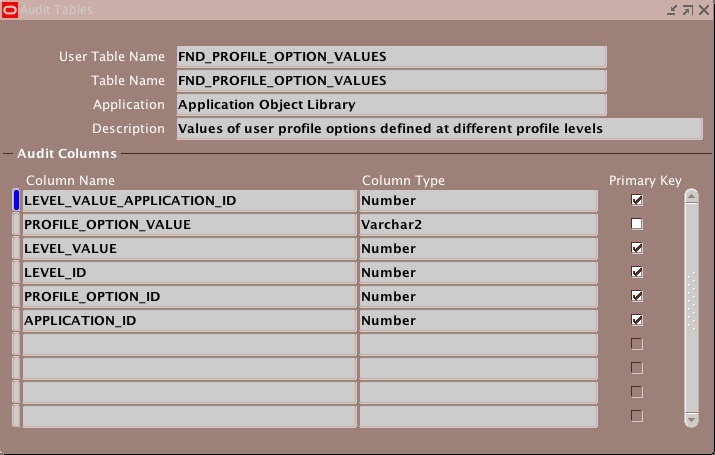 First Table to query is FND_PROFILE_OPTION_VALUES. The columns to audit are in the image below. The other columns are not relevant for the auditing purpose. Second Table to query is FND_USER. The columns to audit are in the image below. The other columns are optional or not relevant for the auditing purpose. After selecting the column we can run a concurrent that will enable the auditing. Running the following queries, the output should contain relevant information related to what was done. It would be wise to create some policy establishing how often the auditing tables should be purged and where and how the data should be archived. Then the concurrent program ‘AuditTrail Update Tables’ should be executed again. Thank you so much. Very useful post. By any chance do you have queries to retrive from the audit tables? nice article… however I have a doubt on purging the data from shadow table… what if, if its connected to interface tables… will it allow to purge data from shadow table and doesnt affect data in interface tables. Verify good article and straight to the point. Now why doesn’t Oracle think of doing that with their docs? Thanks for saving me many hours out of my life.